We're not sure when exactly this started showing up, but we think it's relatively new: the Google Play Store app on Android is showing your nearest Play balance expiration date. That should come in handy if you've been gifted or you purchased some Google Play credit and you forgot when you applied it and when it would expire (usually after one year). I learned that expiration date lesson the hard way once: I got $100 of Play promotional balance and used about $30 sparingly for a few purchases, thinking the rest would last forever, until I once logged in and my balance was zeroed out. I looked around only to realize that promotional balances did indeed expire and I had missed the boat on mine. I'm still sad about that - I could have at least bought Action Launcher's full license if I knew. Anyway, now the balance's expiration and deduction seem to be visible on the Play Store app on your phone under Account -> Payment methods, so you should easily be able to tell how long you have until you need to spend, spend, spend. And that screenshot above? Artem's balance. What are you waiting for Artem? Buy things, now! Since I don't have any Google Play balance of my own to check, Artem tells me this is only showing for him on the Android app but not on the Google Play website (though if I recall correctly, it should be there in the Google Payments center). Let us know if you're seeing it too, and if so, how long it's been there. As many of you have noticed, the expiration date being displayed on the Play Store seems a little ways off. 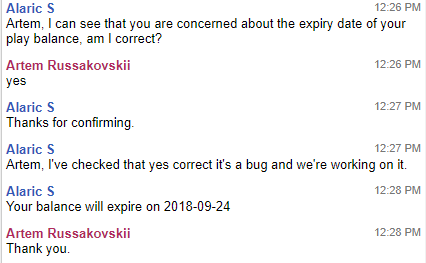 After reading several reports of users contacting customer support and then being told that date is a bug, Artem reached out to the Play Store's support team as well. He got the same reply with a correct expiration date. So fret not if you see a super close date, reach out to support and they'll tell you the real one. Maybe that will also speed up the process of getting the bug fixed.